Jcrystal04. 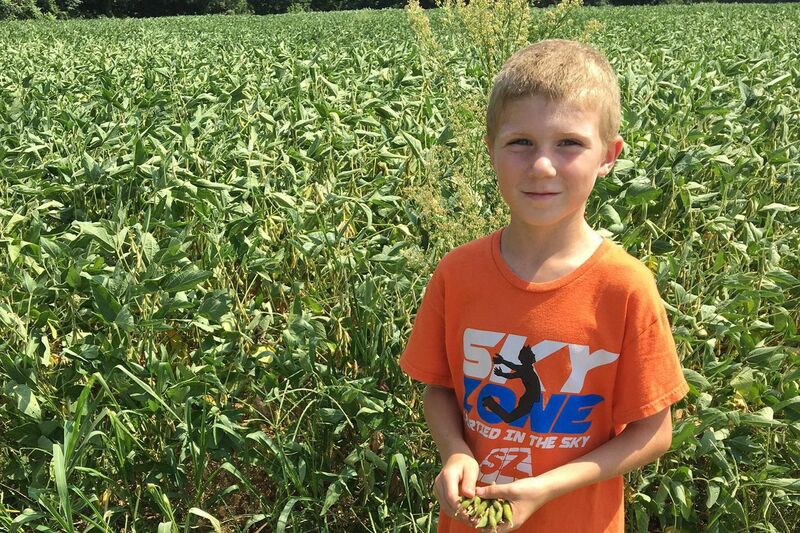 Larry Hart, 7, of Bordentown, N.J. went looking for a fishing hole and found soybeans along a trail in the park. The state's soybean farmers fear their crop could be hurt in the brewing trade wars. Here's one way to deal with the brewing trade war between the U.S. and its trading partners: Stock up on candy, chocolate, snack food, and cans of beer. All are likely to get more expensive if the current face-off with Canada and China develops into a full-fledged trade war. Canada is the largest export market for both Pennsylvania and New Jersey, along with 33 other states. And China is Pennsylvania's number-one source of imported goods, largely electrical and industrial machinery and computers. Unspooling those relationships has consequences. The economies of the United States and Canada are "interrelated," and have been for hundreds of years, said Jean-Claude Lauzon, delegate general for the Quebec Government Office in New York City. "People are just not aware of the density of the relationship that exists between the two countries," he said. This relationship grew with the North American Free Trade Agreement (NAFTA), which took effect in 1994 and sets trade regulations among the U.S., Canada, and Mexico. Lauzon, who oversees the Quebec Trade Office in Philadelphia, noted that nine million U.S. jobs are "directly dependent upon the trade relationship with Canada, with NAFTA," and more than five million are "related to the trade with Mexico." The tariffs — including a 25 percent fee on steel and 10 percent on aluminum — will eventually "shave jobs" on both sides of the border, Lauzon said. Lauzon said the impact will be harder to pinpoint than just industries such as steel, aluminum, and chocolate — all being taxed by either Canada or the U.S. If the cost of aluminum cans for beer or soda rose by 10 percent, for example, that change "will be immediately reflected to the consumer," he said. "So you're asking the American consumer to pay more to impose a tariff on a friendly country." The countries involved in trade standoffs with the U.S. all play major roles in the Pennsylvania economy. The state exported more than $311 million just in candy, confectionaries, cakes, and chocolates to Canada in 2017, said Michael Gerber, press secretary for the Pennsylvania Department of Community and Economic Development, by email. Just behind Canada are Mexico and China as the state's second and third biggest export markets. Besides the $2.56 billion worth of goods that Pennsylvania exported to China in 2017, Gerber said, that country sent $17.3 billion worth of goods to Pennsylvania businesses, about 60 percent of which were electrical and industrial machinery. Although Gerber said it is "still too early to gauge just how detrimental" President Trump's tariffs on China will be, he expects them to raise the cost of machines and have a "negative impact" on businesses in the state that import machinery. Gerber said Pennsylvania's government "strongly supports the Pennsylvania steel industry and has long pushed for targeted steps to level the playing field by preventing steel dumping and international price fixing." But he said, even the increased tariffs on steel will hurt other "manufacturers, energy projects, and prices of a variety of consumer goods" — and "threaten to ignite an all-out trade war that would further damage Pennsylvania's economy." New tariffs are also unwelcome in the agriculture industry. Peter Furey, executive director of the New Jersey farm bureau, said its members are angry about a potential trade war, particularly with China. In retaliation for Trump's increased taxes on Chinese imports, China announced Saturday that it would place a 25 percent tariff on U.S. goods including soybeans. This tariff, set to take effect July 6, would cause "ripple effects" in New Jersey, Furey said. With China — the biggest consumer of soybeans from the U.S. — possibly turning elsewhere for the crop, soybean values could plummet within the U.S. In the last week, those commodity prices have already dropped by 5.67 percent. "We're going to feel a lot of pain in prices," Furey said. "People are already committed in their plantings, and if soybean prices go [down more], then it may cause growers in the future to plant less soybean" due to a lack of reliability. Although New Jersey is not one of the top 10 leading producers of soybean in the U.S., the field crop is still one of the most lucrative for the state. In 2016, New Jersey produced more than $33.5 billion worth of soybean, according to the New Jersey Department of Agriculture. The only field crop with a higher production value was corn, worth more than $36.5 billion in 2016. New Jersey farmers are holding out hope that one side of the escalating trade war will relent and the proposed tariffs will not materialize. Furey said farm bureau members know the situation "could change in a heartbeat," so they aren't overreacting. Still, they "will certainly concede this is very dangerous noise going on, and the last two weeks have been especially bad." "We work very hard in agriculture to get these customers and to do this business," Furey said. "And to have it come partly crashing down because of trade threats is really hard to take." Trump said in April that the government would reimburse farmers for any lost profits as a result of the trade war. Despite Trump's assurances, Furey said, farmers would "rather not lose the business in the first place" and "that statement itself acknowledges that we are at great risk." The threat has also extended to Mexico. Reuters reported Thursday that Mexico is studying the feasibility of placing tariffs on U.S. soy and corn. While Furey can understand the administration using tough negotiation tactics to challenge China, he said Mexico and Canada are "a different story" because "they're good trading partners." Trump's claim that Canada taxes U.S. dairy products at rates more than 200 percent — which he pointed to as justification for increased taxes on Canadian products — "happens to be right," Furey said, but he doesn't understand why that industry is worth destabilizing U.S. agriculture. "It's a fabulous thing for the American economy, and why is it being put into jeopardy?"